Bob Hope Airport in the city of Burbank offers an alternative to travelers wishing to skip the long lines and congestion of LAX. Located in the San Fernando Valley, it is closer to Hollywood and downtown Los Angeles than LAX. Considering its lighter foot traffic and expedited service, this airport is preferred by many for travel across the Western U.S. Although Bob Hope Airport is located closer to many heavily-populated cities in Los Angeles, you still have to fight through traffic to get there. Parking at BUR (airport code for the Bob Hope Airport) while you are traveling requires a daily fee and offers virtually no security to your unattended vehicle. If you choose to take a taxi or a shuttle, you will pay a lot of money for less-than-stellar service, discomfort in poorly-kept vehicles, and the chance of being late to your flight. Skip all of this and reserve a limo to Burbank Airport instead. Our town car service to Burbank Airport allows you to arrive on time and enjoy a clean, quiet ride in private. We deliver hundreds of travelers on a weekly basis in a safe and timely manner to and from BUR. 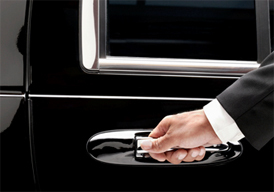 We will pick you up on time, help you with your bags, and allow you to comfortably enjoy the ride in a luxurious vehicle. Check out the special flat rate transfers available for our Burbank Airport limo service below. The $65 flat rate is only available for sedan service to the Bob Hope Burbank Airport and sedan service from Burbank Airport with no additional stops to the above cities. This is a great deal for travelers looking for private car service to Burbank Airport. We also offer a $95 flat fee Burbank Airport limo SUV service for transfers with no additional stops to/from the neighborhoods listed above. Select either an upgraded Chevy Suburban or a luxurious Cadillac Escalade for this trip. Our Mercedes Benz Sprinter vans accommodate large traveling parties. This Burbank Airport car service is perfect for groups too large to fit into a sedan or SUV (7-15 people). Click here for more info about our Sprinter van limo service.